Garlic is a truly delicious allium and is a favourite by many chefs around the world. No meal is truly complete without a dash of garlic when needed. It has a distinct flavour, defined a classic. Not only that, but garlic has lots of health benefits too, research has shown. I will be discussing that later on in this hub. Growing garlic in the garden is easy, and like onions requires little attention, has great results and is perfect for any beginner. Did you ever want to grow garlic but didn't know how to? Or maybe you want some handy tips for growing garlic successfully. Well, this is the hub for you! 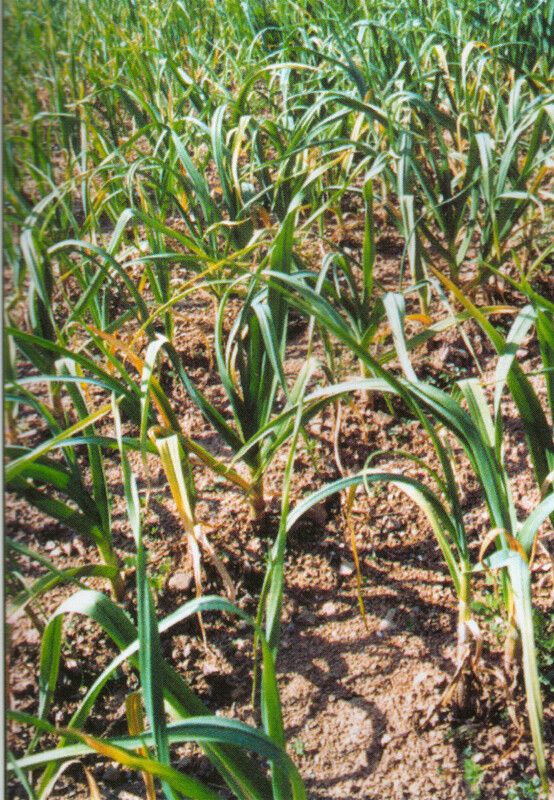 Here, you will learn how to plant garlic, cultivate it and harvest it, with great results. You are bound to find some great tips here, no matter whether you are a beginner or an expert. But first, let's delve into why garlic is so good for you, and how it can benefit your body. Why Should You Grow Garlic? What sets garlic apart from the crowd? Garlic can be stored easily and can be kept for the winter months. 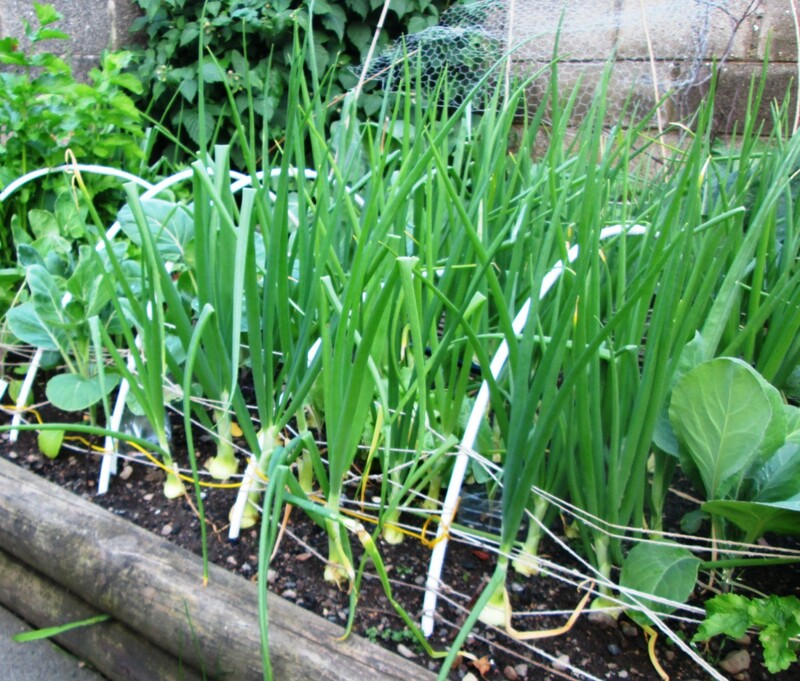 In a small city garden, you can grow almost 50 bulbs of garlic. That's enough for an entire year! Don't worry, growing garlic is easy, cheap and is great for beginners as they require little attention unlike other vegetables. Assuming that you don't mind clearing weeds, you will find garlic a joy to grow. It helps to rid of prostrate, colon and stomach cancer cells, giving you better protection against cancer. It wards off germs and bacteria in the body. Garlic also have many nutrients including potassium, chromium, sulphides, vitamins B and C and selenium. Scientific research has found that garlic contains an antimicrobial compound which prevents the formation of nitrosamine, which is a carcinogen. Carcinogens often lead to cancer. Here is an excellent fact to know when buying garlic. It has been found that 90% of store bought garlic has been radiated on to prevent it from germinating. So that means that if you buy garlic from your supermarket, it will more than likely not grow. To grow garlic, you will need some basic items including garden tools, garlic cloves and fertiliser. You will probably have some of the garden tools in your garage, if not you can buy them on Amaon or at your local garden centre. Garlic Cloves - You can buy garlic from the supermarket if you wish, but most garlic from the supermarket was previously grown in hot climates so if you do not live in a hot climate, do not buy these. Instead, you can buy garlic suitable to your climate at your local gardening centres or on Amazon. Once you have your garlic, split the garlic into cloves. Each bulb of garlic should get you eight to ten cloves, which will result in eight to ten bulbs of garlic in the future. 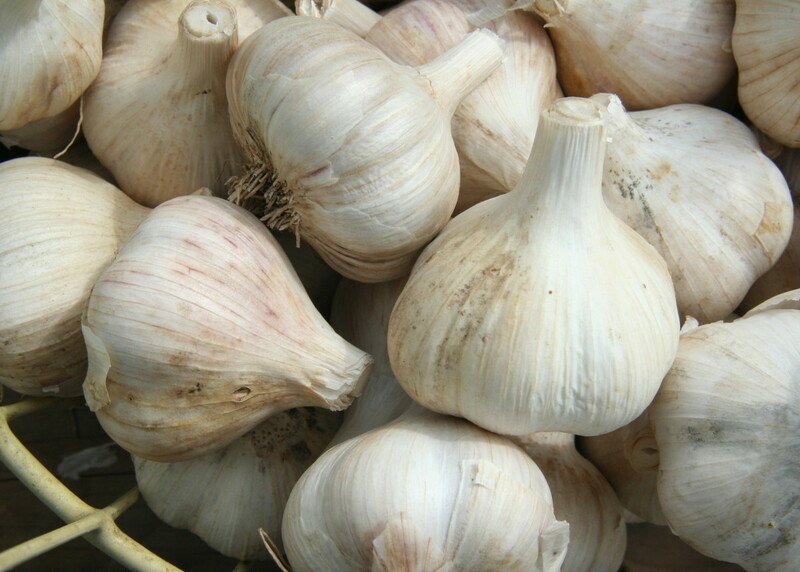 Pick out the big cloves from the small cloves, bigger cloves equal bigger bulbs of garlic when grown. Fertiliser - To get bigger bulbs of garlic, you may want to use fertiliser. You can add fertiliser to the soil before you plant the garlic. However, if you want to stay organic, there is no need to use fertiliser, you will still get good results. You can also buy 'vegetable feed' which has the same functions as the fertiliser. Compost - Rake in two to three bags of compost into the soil prior to planting. This will add extra nutrients to the soil. Others - Common garden tools such as a rake, hoe and garden trowel will provide useful later on when clearing weeds and other jobs. Make sure to plant your garlic in an area where it will get plenty of sunshine daily. That is key to achieving great results. First of all, you need to know when to plant your garlic. You have two options which are outlined below. 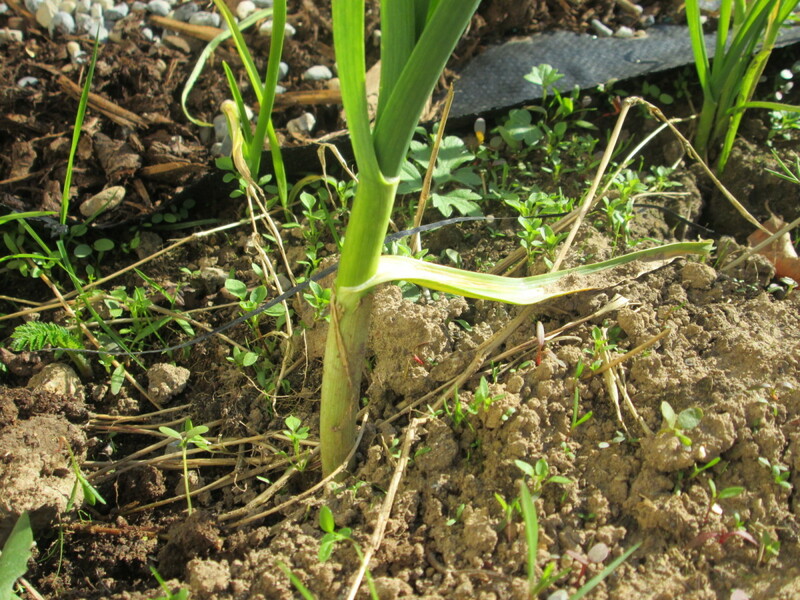 You can plant the garlic in late autumn, the shoots will generally come out during early spring. Or alternatively, you can plant them in early spring and the shoots will come out after two weeks. Now that you have what you need, it is time to get started! Mix in the compost with the soil that you will be planting the garlic in. Set a string in a straight line across the ground. Using your trowel, dig holes in the ground. Make sure each hole is 15 centimetres apart, to prevent cramming. Once you have your cloves chosen (make sure to select the big cloves from the small cloves - bigger cloves equal bigger bulbs of garlic). Place each clove into each holewith the white base facing into the ground and the pointy end facing the sky. It would be ideal to place the garlic about 2 to 3 inches into the soil. Once you have finished planting your cloves, cover the cloves with compost. Fertilize the soil straight away, this is optional. 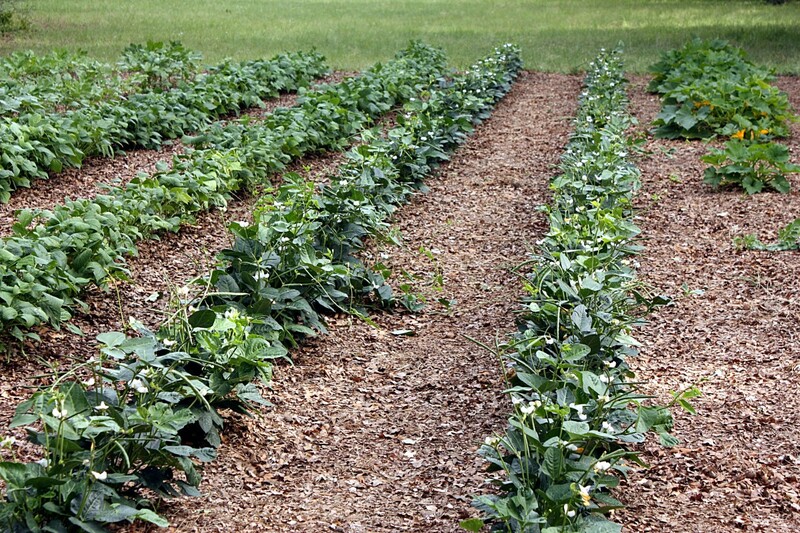 Follow the instructions on your fertilizer or vegetable feed and spray the ground where the bulbs are. Keep watering often, if you live in a hot, dry climate. However, if it rains there is no need. 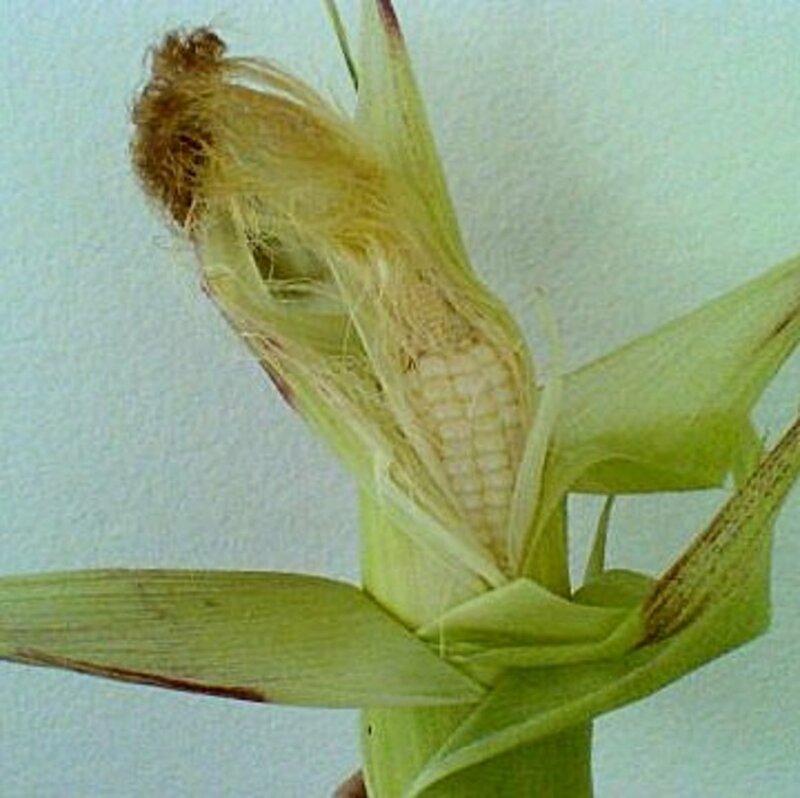 Do not overdo on the watering! Garlic does not like overly wet soil! 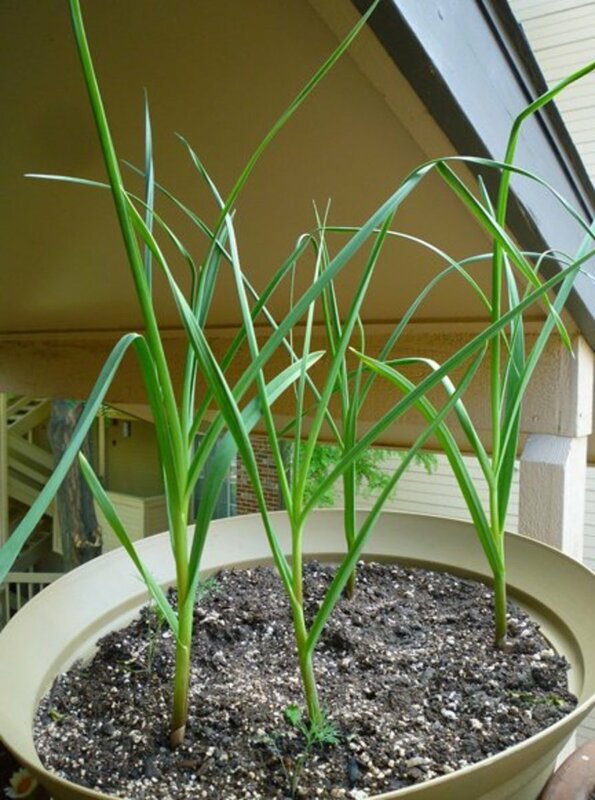 If you live in a city apartment or you are tight for space, garlic can be grown in containers in the porch of your home or even indoors. All you have to do is to fill a container with compost. Then dig holes about 2.5 inches deep into the compost, and make five to six holes per container. Water every two to three days depending how damp the compost is. As I mentioned earlier, don't over water the garlic. So whilst you have to wait for the garlic to be harvested, there are plenty of things to do in between. If you planted your garlic in your garden, you will need to clear away any weeds by hand or by a hoe. 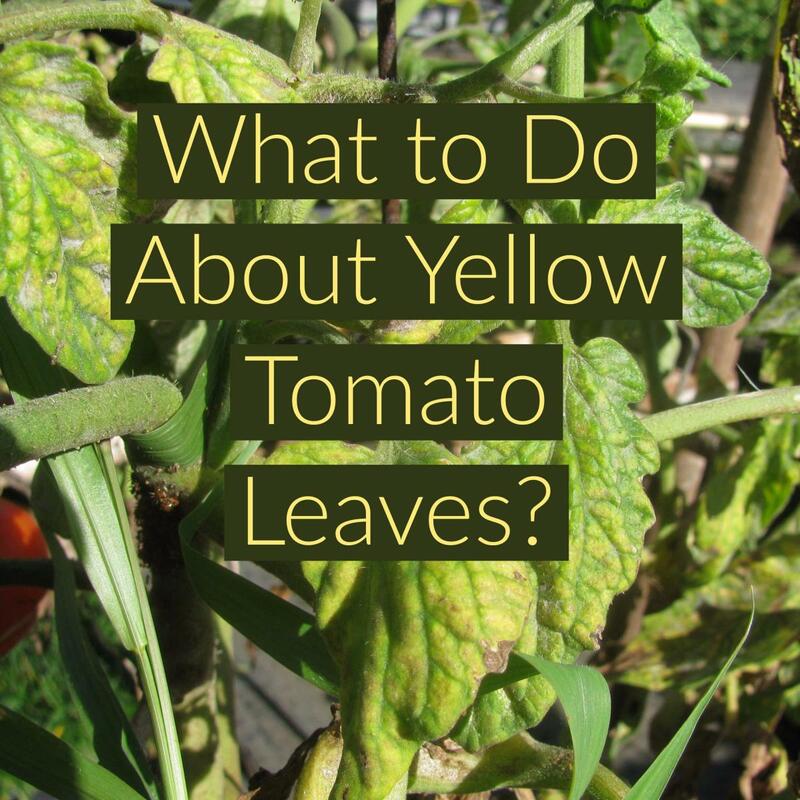 This may not be a task you may enjoy, but it's a task all gardeners have to do! It should only take twenty to thirty minutes every three to four weeks, that way your garden will be kept free of weeds. Remember to fertilize every two to three weeks. Also, water when the soil becomes dry. That's it! I told you there wasn't much to do with garlic. Once you follow the steps above now and again, you will be on the path to harvesting great garlic! Take a look at the picture on the right. 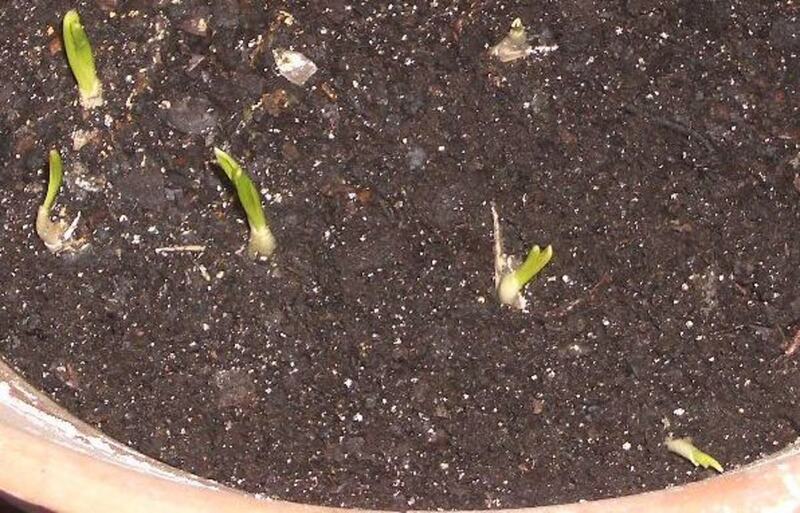 This is what garlic looks like after three months. Would you like to grow garlic? I would like to grow other vegetables. At the start of Autumn, the wait is finally over and you can harvest your garlic! There are two signs to look out for. Firstly, you will see the scapes (shoots, green stems) turn brown or yellow and dry out. Secondly, you can feel the individual cloves formed within a bulb of garlic. When you see these signs, it is time to harvest your garlic. Do not wait any longer as the clove will shatter into individual cloves. To harvest, gently loosen the soil around the garlic and gently pull the garlic from the ground. Brush away any dirt from the clove and leave your garlic to dry for a few days. Onions are a fantastic vegetable to grow, they are easy to plant, require little maintenance and are great for beginners. 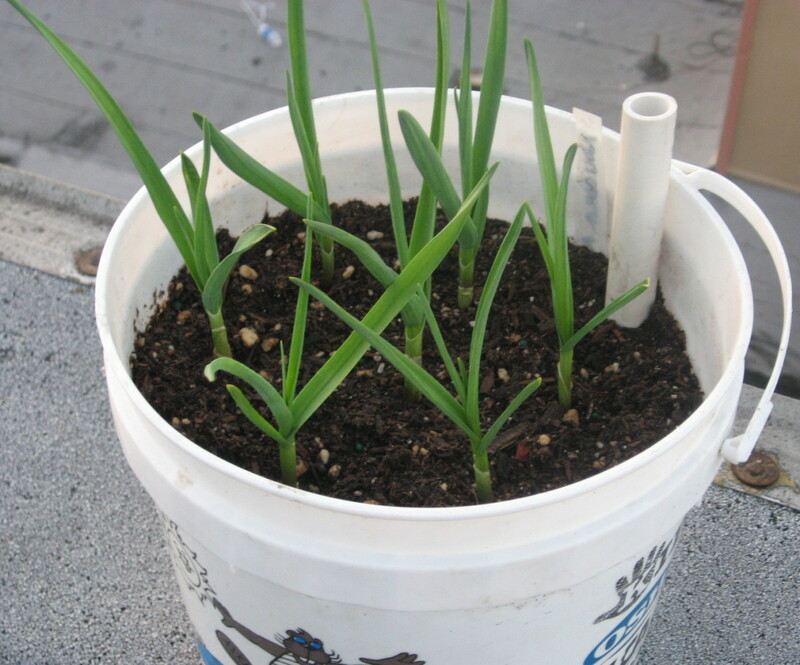 This hub will explain how to plant, grow and cultivate garlic, with pictures. Now that you have your garlic, you may want to store your garlic for the winter or for a few weeks. There are two ways to store your garlic. The first is to braid your garlic. Just take one garlic with the shoot and then tie the others around it. Then you can hang the braided garlic in your kitchen or in the pantry, so you can take a clove or two when you need to use it. Or, you can store your garlic in a ventilated pottery container, made ideally for garlic. You can buy a container on Amazon. They are ideally very handy as you can store the garlic there for months. For an extra tang, you can store your garlic in vinegar or oil. However, bacteria may grow on the garlic so keep in the refrigerator and consume within two to three days. I'll grow garlic in my backyard and I'll share with you how it grows. I'll follow these simple steps! I would like to see a discussion of how to grow garlic in containers starting with garlic bulbils. 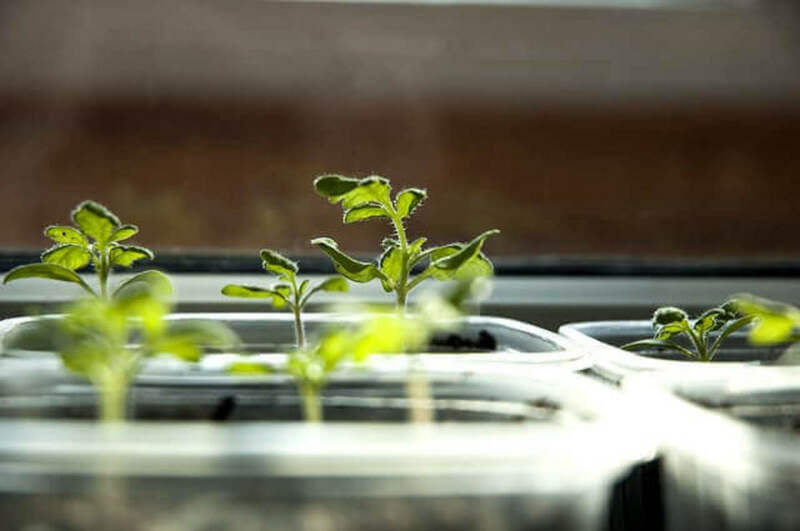 Of interest would be when to plant bulbils, what size container, where to put containers in winter, where in growing season, when to harvest rounds and when to plant rounds for second year, etc. Myrna - Thank you very much. I am glad this helped you. warm welcom honey! i hope too he will enjoy both reading it and then growing too . again thanks for sharing dear, stay blessed! Thank you for commenting, I am glad you found it very useful and I hope your brother will enjoy growing garlic, it is a very nice vegetable to grow and is easy to maintain. Thanks again for your wonderful comments and for following me! oh so very interesting and informative detailed article on this topic. i my self don't grow anything but my younger bro is very fond of gardening, will ask him to read this hub, very informative indeed. he really loves to grow vegees and other plants as well. thanks for sharing Susi dear, stay blessed! Yes, it takes about 5-6 months until you harvest your garlic. Bear in mind that garlic requires little maintenance, only to clear the weeds. Even if it is very hot in the Philippines, you can still grow great garlic. Thanks for reading! from autumn to spring that is 6 months right?so i have to wait for 6 months to harvest the garlic.but i am from Philippines we are hot here hehe. Thanks for the great comment, and for reading. As you said, garlic is a very economical plant where you can grow so many in such a small space. Thanks for the vote up! Thank you for reading this hub about garlic and thank you for the excellent information you just gave me. That is quite interesting, I never knew that 90% of garlic in shops was radiated on! I will keep that in mind in the future and will make a reference about that fact in this hub in an hour or so. Thank you!! I have planter garlic for the first time this year. I usually plant garlic from the fruit market but non or only a few plants will grow. Then I went to a nursery and the gave me seed, telling me that 90% garlic in shops is being radiated to stop growth on the self. I am glad you found the tips useful and thanks for reading! Yes, I say that your soil is probably to heavy for it, or the soil is too wet. I would suggest you mix in some compost or try growing them in pots filled with compost. Thank you again for the amazing comments! I use a lot of garlic in my cooking, but didn't have much luck when I tried to grow it - all I got were tiny little bulbs. I think my clay soil is too heavy for it, so may try again in some better soil - perhaps in pots as you suggest. thanks for the tips! Thank you for the wonderful comments! Thank you for pinning and voting up, I cannot say how grateful I am! Yes, leaving garlic to grow wild in your garden is a great idea, the flowers must be beautiful. I never thought of doing that, but I definitely will next spring! Thank you for reading, yes garlic has quite a delectable aroma and is great to cook with. i cannot cook without garlic.i love it's aroma.now i know that amazon also sells vegetables. As a lover of Garlic myself I was drawn to this hub. I have lots of garlic growing in my garden. I do not harvest it though I have it scattered around and I let it grow wild. The bulbs give out a lovely white flower. Thank you for sharing this hub and hopefully it will encourage others to eat more garlic as there are so many health benefits to having fresh garlic in your daily diet.